lo and behold, once again there was a treasure trove of good ideas. Incremental Search, and Find Usages. caret row when going to next of Find, Incremental Search, etc. minimal amount so that 5 rows from top/bottom edge. Find Results window marks the item as INVALID. the original line number when the search was done. column number of the item. but not after you restart. Can you make this a user preference? Results / Locate Duplicates Results. See screenshot. F3 should not change editor's view when re-finding single match. Find in Path. No one wants to see the modal search progress dialogs! (See attached). IDEA should support launching multiple search and/or analysis tasks in the background. running tasks (typically the user would set this to match number of cpus or cpus -1). max-concurrent tasks would run at one time. the time Demetra is released. Cosmetic: Find Usages tab names should not include the scope, i.e. (IDEA-3655 suggests putting the search term first and in boldface). not being in the tab name, but it should be in the title. copy snippets of code without loading the file into the editor pane. Performance: Find Usages appears to have great potential to be speeded up. if there are opportunities with Find Usages to make similar improvements? this faster. Find Usages can take minutes on large projects. to 3X slower than 4.5 on some methods for me. 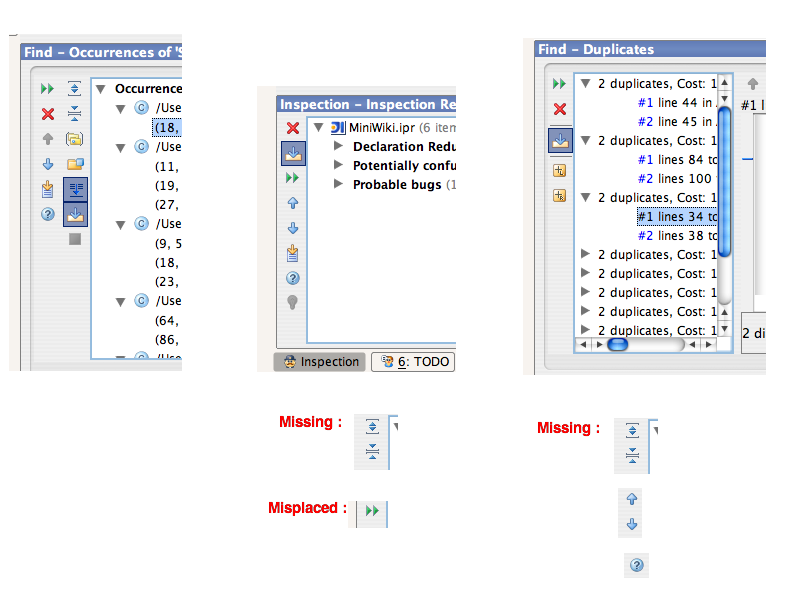 Enhancement: Find Usages/method -- Find entry points to a method. 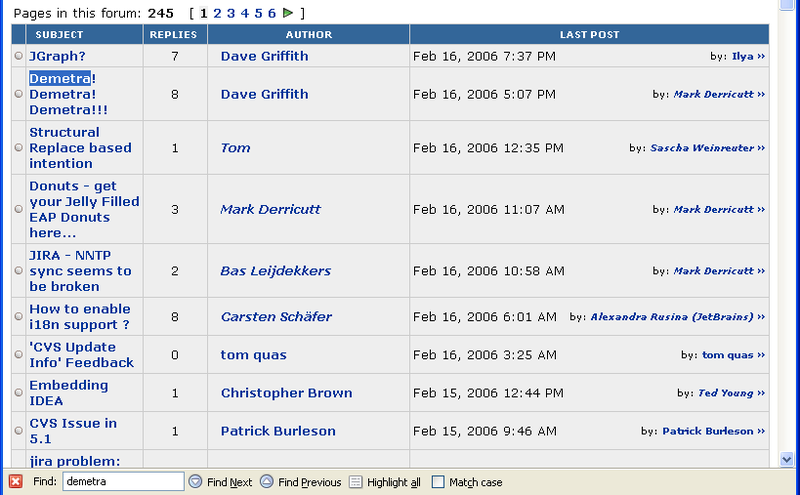 then it gives you the benefits of both Incremental Search and the Find Text window at the same time. while in Incremental Search mode, it should carry over the current search term. The title of the above message should have been "Find Usages". I wish there was an Edit feature on www.intellij.net ! Enhancement: Should allow multiple comma separated file name filters (.jsp,. html). Currently only accepts a single file name filter. of filetypes. So, you could select XML, XSL, and XHTML for example. you want to skip it" It does this every time I want to do a search. individual files or directories to be excluded from searches? Search always pauses when a large file is found. leverages IDEA's knowledge of different languages/file types. and servlets which may refer to these inside java string literals. get a ton of matches. structure, it would be further brokend down. "Java code No Comments", or "Strings". IDEA could even come with these predefined. included to use the feature. s builtin understanding of the structure of various languages. During my slog through the Jira IDEA swamp and IDEABKL dump, I discovered the following issues were Fixed/Duplicate. Find / Replace / Find in Path / Replace in Path doesn't support editor keymap for editing the 'Text to find' and 'Replace with' textfields. also have the $$ to spend on professional tools like IDEA. so I think it is important that potentially longrunning tasks should always run in the background. Support for Dual Core: Locate Duplicates should run in the background. Find in Path doesn't display the scope in the title.